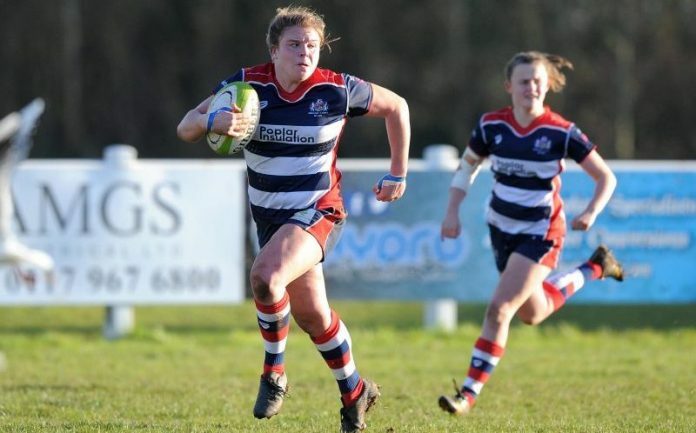 Yesterday Bristol Ladies claimed the top spot in the Women’s Premiership for the first time in the club’s history. The bonus point victory over Wasps Ladies set up a home play off semi final against Saracens Women on April the 9th and the focus now turns to the Plate final next weekend, and progressing through the play offs. The home side put five tries passed Wasps in the first half, with the forwards showing their dominance. Returning international Izzy Noel Smith (sponsored by Prior Park Schools) set up the first try of the afternoon, breaking through several Wasps tackles to send Clara Nielson over the try line on eight minutes. Four minutes later Poppy Cleall (sponsored by The School of Dance) ran a beautiful line and dotted the ball down under the posts. Cat McNaney scored a phenomenal solo try moments later, stealing the ball from the opposition mid tackle and running the length of the pitch to get the third of the afternoon. A well executed scrum resulted in Nielson getting her second of the game, whilst a strong ball carry and break almost saw Kayleigh Armstrong (sponsored by Maidenhead Aquatics) score, however unselfishly she passed the ball onto Sarah Bern (sponsored by Fifth Consultancy) to secure the points for the home side. Two conversions from the boot of Lucy Attwood took the halftime score to 29 – 0. Wasps reset at half time, and scored minutes into the second half as Bristol were slow out of the blocks after the break. However, this sparked the home side back into action, and Bern showed her pace as she received a well timed offload from Captain Buckland-Hurry to get her second of the afternoon. Bern then secured her hat trick with the last play of the game to score directly under the posts. Cleall also added a second try to her tally on 65 minutes. Sarah Graham took over kicking duties during the second half, with two successful conversions ending the game on 48 – 7. Eight tries from Bristol earned them a bonus point win, finishing the regular season on 60 points and top of the table. Lichfield, who have always been hot on their heels all season, finished second on 59 points after their win over Richmond Saturday. The play off semi finals are now set, with Bristol facing Saracens, and Lichfield facing Aylesford Bulls – both games due to be played on the 9th April. Next week Bristol are back in cup action, running out in the Plate Final being held at Royal Wootten Bassett RFC where Bristol Ladies face Worcester Valkyries, kick off is 3pm. 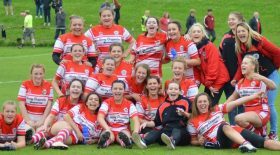 Bristol Ladies would like to say a big thank you to all their supporters who have cheered them on all the way this season, and their sponsors for all their support – they said: ‘we look forward to continuing our journey this season with you’.